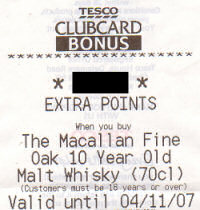 Regular Tesco shoppers and Clubcard owners will know the various coupons you get from Tesco, either with the Clubcard statement or printed directly at the checkout. Tesco is known for the sophisticated data mining and taylored marketing programs they create from it. So why this coupon? I'm sure The Macallan is a very nice whisky, I think I've even tried one a few years ago. But then it just wouldn't be right for me. I prefer my Islay Single Malts, several of which Tesco stocks. Laphroaig, Ardbeg, Bunnahabhain, Lagavulin, Bowmore and Caol Ila are the ones I've seen at my local store. And I'm slightly surprised that Tesco is trying to make me being unfaithful. After all they probably know what I usually buy? No, I didn't use the coupon.